1) To help poor people and their children understand public art, especially the drunk and high community from Rockford, IL. 2) To help my friend, Kevin, do his masters thesis on public art for NIU. 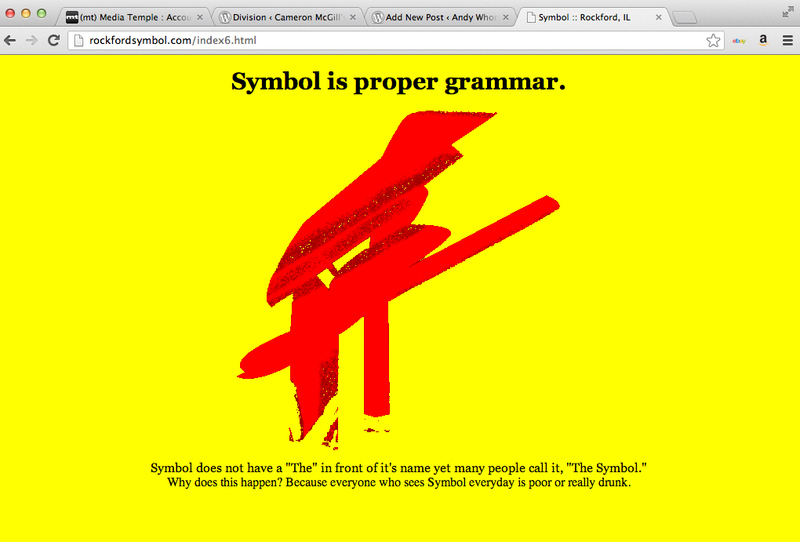 See the “facts” section at the end of Symbol’s bedtime story site for proof. 3) To own the domain name “rockfordsymbol.com” with hopes of the city buying it from me in an effort to screw them in return for all the financial pain and suffering, loss of jobs, belittleing of the working class, the shoving out of educated people to other cities, that our leaders from both the business and government sectors have caused the community over the last few decades with ineptitude, corrupt spending, and pathetic conservative leadership that has held the community back for decades. Bids for the domain name start at $12,000.00 and go up.